For more than a dozen years, the members of the Mesa Artists Studio Tour (MAST) have earned a reputation for quality art and hospitality. Their annual autumn weekend event welcomes the public at no charge to home studios perched on airy slopes, or tucked along seaside lanes or down shady byways. For many visitors, taking the tour has become a autumn tradition. Most drive, but some tour by bicycle, or even walk. Since the early 20th century, the Santa Barbara Mesa has been a haven and inspiration for noted Western artists. That’s not surprising since The Mesa soars upward just west of the city’s picturesque harbor, with bright hillsides above miles of dramatic beaches and sea cliffs. Removed from the bustle of the city center, The Mesa is blessed with gorgeous views of mountains, ocean, offshore islands, and natural areas unsurpassed on the California Coast. It’s simply fun to explore and find tour studios along the way. All award winning artists, the Mesa group makes sure each visitor enjoys a peek into their working world and their art. Many offer light refreshment. Original works on display are for sale, with a wide range of sizes and prices. Some artists also offer limited edition prints, or greeting cards based on their art, and credit cards are widely accepted. To take the 2016 tour, go to the website home page and select map or tour brochure to download. The materials include dates and times, artist profiles, and art samples. Or, you can view the information via the website on your cellphone or computer notebook. On tour days, yellow signs and red balloons also point the way to each studio. – Morgan Green’s pastel and oil landscapes and seascapes rise from the famed California Impressionist school, with dramatic outdoor light effects that create visual poems. Works range from 8 x 10 to 24 x 36 inches. – Sara Woodburn’s woodblock prints are inspired by nature and are created by employing expert Japanese and Western techniques for works from card size to 18 x 24 inches. – Wendy Brewer discovered mosaic as an art form 20 years ago, and creates works like mixed-media collages using polymer clay, gold leaf, crystals, metals, beads, specialty glass and mirror components. – Carissa Joie Luminess brushes brilliant watercolors on paper for florals and landscapes that simplify subjects into haikus of line and color, often in very large formats. – Danuta Bennett creates paintings, drawings and photographs mostly featuring architecture, cityscapes and landscapes in the expressive realist style inspired by her Eastern European heritage. – Nancy Hull usually paints small to medium sized realistic paintings that reflect her studies of nature here and on world travels, and often feature birds and wildlife. At times she experiments with colors and values. – Bill Hull’s oils, watercolors and stained glass works, in mostly small format, spring from the outdoor artist’s experience with natural colors and changing sunlight. – Karin Aggeler focuses on abstract expressions of landscapes, and moods and memories in vivid or soft hues on canvas, with works from 12 x 12 inches to 5 feet. – Meg Ricks is known for expressive and abstracted oils and pastels derived from landscapes or seascapes and painted outdoors, with works ranging from very small to 4 x 6 feet. – Myla Kato devotes herself to plein air painting and figure drawing to create loose, dynamic works with bold movement and vivid texture. Size depends on her mood and subject. 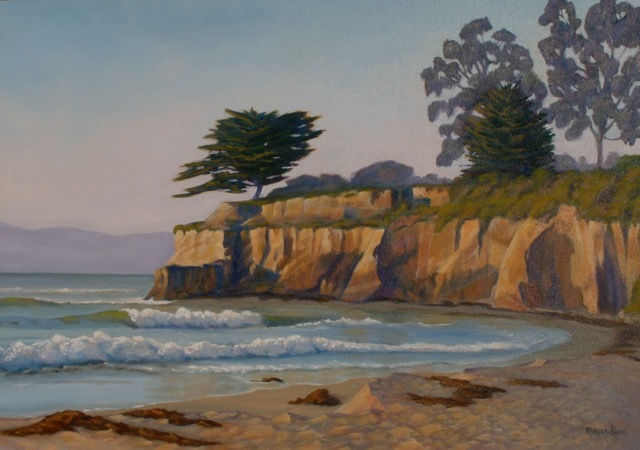 – Lynn Humphrey employs pastels to convey representational landscapes and seascapes in small to medium sized paintings, using the beauty of California and its coastline as her inspiration. – Sally Hamilton paints in oils to produce colorful, bold botanical still-life works, abstracted figures, and landscapes in an impressionistic style, with many paintings 16 x 20 inches.